There are many different types of soup (thick, creamy, clear, cold, etc). The difference often lies in the texture. Once thought of as a starter, nowadays soup is often eaten as a light evening meal, particularly in winter when vitamins are hard to come by but very necessary! In summer, cold soups and gazpachos are really refreshing. 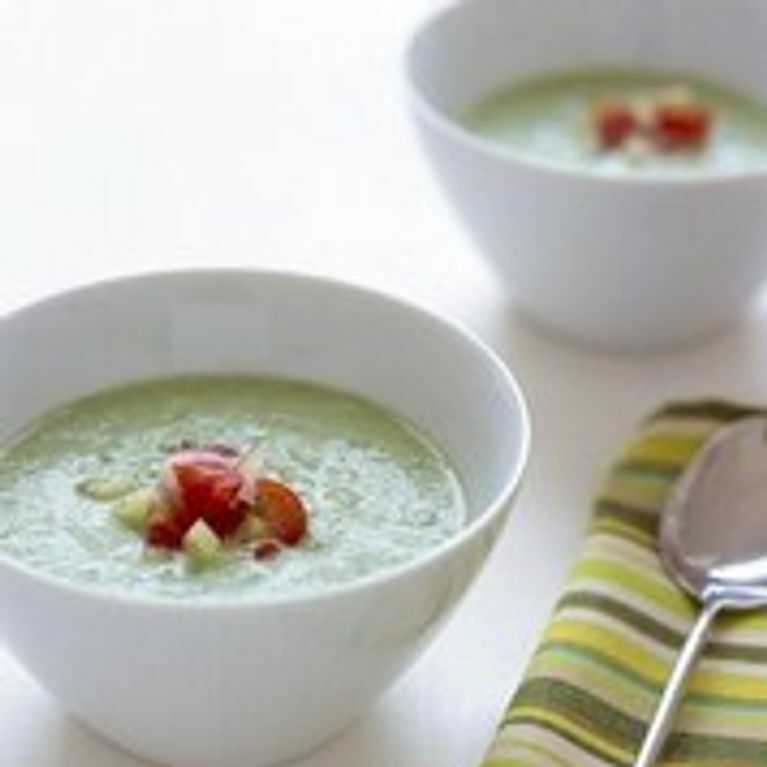 And sweet soups do exist...Take a look a bit further down! Add potatoes or pulses: lentils, chickpeas, beans, etc, and not too much water. You could also start by preparing a purée and then adding your stock a bit at a time. Use vegetables, water and salt. You can replace potatoes with courgettes, which are lighter. A bit of cornflour will also thicken your soup and won't make you feel as if you're drinking diet vegetable water. A blender is a must, as is crème fraîche or beurre manié (half soft butter + half flour) added at the end to give a wonderful creamy texture. Tip: courgettes and broccoli also give a nice texture, as do potatoes, which are rich in starch. First cut the vegetables into large chunks, and when blending, stop before the soup goes smooth and creamy. Alternatively, make creamy soup and add fried vegetables: the taste is like no other! Add leeks and any other green vegetables you like! Avoid putting in too much carrot, pumpkin, red/yellow pepper, etc. QuickReady-prepared frozen vegetables + water and seasoning. Put it all in a pressure-cooker and close. Once it starts to whistle, leave for 30 minutes. Give it a mix and serve! You'll need a blender to mix your raw ingredients: cucumber, tomatoes (for famous gazpacho), beetroot etc. Steam the other ingredients, then blend and add seasoning, or boil and season at the end. For gazpacho, refrigerate the soup with ice cubes inside instead of water (when they melt they'll refresh the soup and make it lighter). Try chorba (North African lamb and chickpea soup), creamy broccoli, roquefort and ham soup, bean soup with chorizo or fish soup. Made from stock and vegetables, noodles, and optional meat and fish. Put in plenty of spices, herbs and seasoning, and don't overcook the noodles. You can also add an egg just before serving and stir it until it's all spread out, to produce a pretty effect. Just place your peeled and chopped vegetables in it, cover with water or stock, salt, pepper, herbs and spices to taste, close the lid and wait 30 minutes after you’ve turned the valve. Same principle as the pressure cooker, for a magnificent taste like grandma’s soup: first brown the vegetables in a bit of oil or with diced bacon fat. Once golden, cover with the stock and leave to simmer for 1 to 2 hours. The longer it simmers, the better it is. It might sound strange but you can make soup in the oven! And it's an energy saver because you can cook several dishes at the same time! Oil a casserole dish (with a lid), put your vegetables in it, pour over a bit of water or stock and close. Leave to cook for 1 hour at 180°C (Gas Mark 6). Towards the end, you can leave it to cook with the lid off to evaporate excess liquid if there is any. Soup can also be eaten as a dessert! Surprising as it sounds, it’s delicious and makes a nice change. Enjoy sweet soup with biscuits. Coconut milk is used a lot in Asian desserts. It makes a good base for sweet soups (note that it's high in fat) and you can add chunks of fruit, vermicelli, soya beans, red kidney beans, etc to it. It tastes best when served warm! Similar to custard, this is runnier and can almost be sipped. A bowl of crème anglaise and poached egg whites is a French delicacy known as an île flottante (floating island) and is delicious! A smoothie is basically cold soup served in a glass, but it can still be served as a dessert! Blend fruit, sugar or honey, milk, yoghurt or ice-cream together. Eating this amount of vitamins never tasted so good! Like a cup of hot chocolate, only with more chocolate! It's even better served warm with a few scoops of ice cream or with whipped cream added just before serving. Like savoury gazpacho, but with sweet ingredients. Make cold soup with red berries and currants (use fruit mixed with sugar and other flavours if you wish), and serve it with diced gingerbread, small cubes of pineapple and mango, melon balls, chocolate shavings or whatever takes your fancy! For more suggestions, see our soup recipes!